Dear yogins, if you are around in Brussels today, feel free to join me for a 90 minute yoga class in the Sampoorna Yoga Studio at 6PM. We’ll do a full Sivananda yoga class including headstand, so come if you want to practice your postures and start the week well with yoga. Categories: Yoga classes | Tags: asana, Brussels, Hatha, pranayama, Sampoorna, Sivananda, yoga, yoga class | Permalink. My plan is to put all the yoga videos I made some months ago online in the coming weeks and months. I just need to add voice-overs, that takes time. Hereby already a Pranayama video: Anuloma Viloma, video # 2. Anuloma Viloma or Alternate Nostril Breathing is one of the 2 Pranayama exercises that should be practiced on a daily basis in the Sivananda Yoga tradition. After the Kapalabathi breathing exercise follows the Anuloma Viloma. Enjoy your practice: hereby the video with voice-over for 8 rounds of alternate nostril breathing (Anuloma Viloma). Categories: Pranayama, Sivananda, video, Yoga info | Tags: Anuloma Viloma, Hatha, pranayama, yoga | Permalink. As from Saturday 6 February 2016 my weekly yoga class at Sampoorna Yoga Studio starts at 11:30AM, it’s a 60 minute hatha yoga class, Sivananda style, all levels. Looking forward to welcoming you in class. Categories: Sampoorna, Sivananda, Yoga classes, Yoga info | Tags: asana, breathing, Brussels, pranayama, Sampoorna, Sivananda, yoga, yoga class | Permalink. Maybe you browsed this blog already and know that the entire Sivananda yoga class is described for your use and benefit. In order to share the teachings of Gurudev Swami Sivananda and Swami Vishnudevananda even more, I’m posting a daily reference to a full 90′ class on the Facebook page to encourage practitioners to come to the blog and discover the entire sequence with its benefits and step-by-step guidance per exercise or pose. You end your class with a nice long Savasana and then 3 “Om”s. Categories: Pranayama, Sivananda | Tags: asana, chanting, pranayama, Sivananda, yoga, yoga class | Permalink. Pranayama is a key part of my yoga classes. And after a couple of classes most of the students get it, or at least go with the flow. Sometimes there are students in a class (new to yoga, or new to the way I teach my classes) that don’t get it. They sit there, play with their toes, look around them, jawn, looking bored, … Often I think how great it would be to be able to teach each new student a private class to explain the importance of Pranayama and to teach them the exercises that I was taught in my different TTC’s. In short, Pranayama (Sanskrit: प्राणायाम ) is one of the 5 points of yoga: proper breathing. It teaches us to control our breathing, to control our minds and meditate easier. ‘Prana’ means : subtle energy, life force or vital energy. ‘Ayama’ means: to extend or draw out. “Pranayama uses breathing techniques to influence the flow of prana in the nadis or energy channels of the energy body (Pranayama kosha).” -> From the book: Asana Pranayama Mudra Bandha by Swami Satyananda Saraswati. In today’s world, people often don’t breathe properly, meaning, they breathe in the top parts of their lungs only. You may notice this when you are stressed out or when sitting with hunched shoulders in front of your PC. As soon as you lie on your back and try to breathe deeply in through the nose into the abdomen, you will realize the force of proper breathing: you will quickly feel more energized, more calm. Personally I found Pranayama to be life-changing. One day without my morning Pranayama exercises shows me directly the need for it. I am more calm, focused & in the present moment when I practice breathing exercises in the morning. What does Pranayama teach us? It teaches us to breathe properly, to use the full capacity of the lungs, to draw more freshly oxygen in & more stale air out of our body. This gives more oxygen to the cells, including the brain. In a regular 90′ yoga class, I teach two main pranayama exercises: Kapalabathi & Anuloma Viloma. If you are new to yoga, try to just follow the explanations and the counting of the breathing exercises, try not to judge (yourself, other students, the teacher) as hopefully you’ll soon become aware of the subtle changes in your breathing and your life thanks to the benefits of these exercises. Categories: Pranayama, Sivananda, Yoga classes, Yoga info | Tags: Anuloma Viloma, breathing, kapalabathi, nadi, oxygen, pranayama, yoga | Permalink. The Sampoorna Asana Challenge workshops, on the first Sunday of each month, are long hatha yoga classes focusing on a specific theme. In the Asana Challenge classes you can grow in your practice by fine-tuning your poses by through precise instruction and correction and learning poses step-by-step. In the yogi c tradition, the breath is seen as the outward manifestation of prana, or vital energy. Gaining control of the breath by practicing breathing exercises – pranayama – increases the flow of prana through the body, which literally recharges body and mind. Your aim should be to pranayama for up to 30 minutes every day, preferably in the morning to kickstart your digestion and start your day refreshed. In this Asana Challenge we take the time to practice the key breathing exercises (abdominal breathing, full yogic breath, Kapala Bhati, Anuloma Viloma) step-by-step in a correct way, learning how the breath can influence our mood, health and asana practice. Who? This workshop is open for all levels, including beginners. Categories: Pranayama, Sampoorna, Sivananda, Workshop, Yoga info | Tags: anulomaviloma, breathing, Brussels, kapalabathi, prana, pranayama, Sampoorna | Permalink. Yoga cleansing exercises are known as ‘kriyas’. They assist our bodily functions to remove waste products.Since we live in a world where the air, water & food are quite polluted, we need ‘kriyas’ as our bodies can’t quite deal with this pollution on its own anymore. In this post I’d like to explain the benefits & the how-to of the nasal cleaning. Neti is a simple technique for cleaning the nose, nasal passages and sinuses. This cleaning method is especially beneficial for people that suffer from allergies, often have congested sinuses OR common colds. It’ll help to maintain easy breathing and combats pollution. The neti pot is used together with lukewarm water and some (preferably) Himalaya salt. 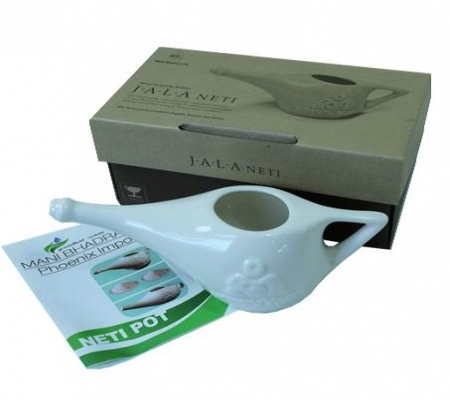 Instead of buying medicine when you do get sick, jala neti is an easy, cheap way to prevent you from getting sick. Jala Neti (sanskrit) means water cleaning. You can buy a neti pot online (i.e. : yogashop) or in a yoga studio near you (i.e. Sampoorna in Brussels) and only need salt (i.e. sea salt or Himalaya salt). A neti pot will cost you between 5 & 20 euros (depending on the quality, type (plastic or ceramic). How to use the neti pot? In the beginning you might find it scary or some water will come into your mouth, don’t worry nor get scared, take your time, experiment with more or less salt, colder or warmer water until you’ve found which combination of salt/ water works best for you. Do not inhale the water, it’ll simply flow through the nostrils through the tilting of your head. You’l be amazed of what comes out of your nose and how much lighter your head feels after this cleaning exercise. Repeat it on a daily basis. If you feel a cold coming up, or already have one, you can repeat jala neti two to three times a day. TIP: add the jala neti to your morning ritual, after a little practice you’ll only need 5 minutes for both nostrils and will immediately after feel the difference as it’ll be much easier to breathe & do your Pranayama. Categories: Neti, Pranayama | Tags: Ayurveda, breathing, cleaning, cleansing, cold, daily, jala, neti, pranayama, salt | Permalink.